TECHNICAL SPECIFICATION DOCUMENT HYDRAULIC POWER UNIT DESCRIPTION: The hydraulic power unit is a machine that provides the fluid power necessary to operate a hydraulic component. Quantum’s Remote Supply (QRS) units are the drive train of a hydraulic power system. 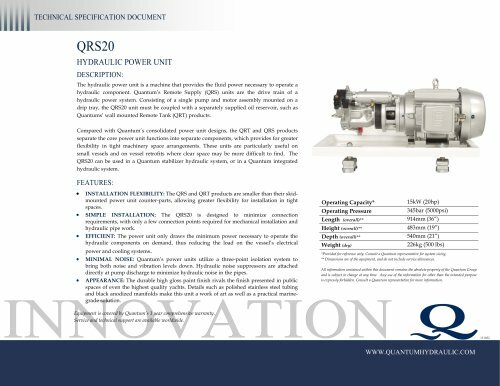 Consisting of a single pump and motor assembly mounted on a drip tray, the QRS20 unit must be coupled with a separately supplied oil reservoir, such as Quantums’ wall mounted Remote Tank (QRT) products. Compared with Quantum’s consolidated power unit designs, the QRT and QRS products separate the core power unit functions into separate components, which provides for greater flexibility in tight machinery space arrangements. These units are particularly useful on small vessels and on vessel retrofits where clear space may be more difficult to find. The QRS20 can be used in a Quantum stabilizer hydraulic system, or in a Quantum integrated hydraulic system. FEATURES: INSTALLATION FLEXIBILITY: The QRS and QRT products are smaller than their skidmounted power unit counter-parts, allowing greater flexibility for installation in tight spaces. SIMPLE INSTALLATION: The QRS20 is designed to minimize connection requirements, with only a few connection points required for mechanical installation and hydraulic pipe work. EFFICIENT: The power unit only draws the minimum power necessary to operate the hydraulic components on demand, thus reducing the load on the vessel’s electrical power and cooling systems. MINIMAL NOISE: Quantum’s power units utilize a three-point isolation system to bring both noise and vibration levels down. Hydraulic noise suppressors are attached directly at pump discharge to minimize hydraulic noise in the pipes. APPEARANCE: The durable high gloss paint finish rivals the finish presented in public spaces of even the highest quality yachts. Details such as polished stainless steel tubing and black anodized manifolds make this unit a work of art as well as a practical marinegrade solution. Operating Capacity* Operating Pressure Length (overall)** Height (overall)** Depth (overall)** Weight (dry) *Provided for reference only. Consult a Quantum representative for system sizing. ** Dimensions are of the equipment, and do not include service allowances. All information contained within this document remains the absolute property of the Quantum Group and is subject to change at any time. Any use of the information for other than the intended purpose is expressly forbidden. Consult a Quantum representative for more information. INNOVATION Equipment is covered by Quantum’s 1 year comprehensive warranty. Service and technical support are available worldwide.